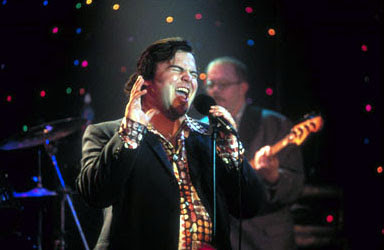 What to say about Jack Black, the over the top comedian who rose to prominence with his role as Barry, the obnoxious record store clerk, in the 2000 film, High Fidelity? As the final installment of this site's coverage of the tenth anniversary of the release of that film, we pause to reflect upon Black's performance at the end of the film, during which he covers Marvin Gaye's immortal classic, "Let's Get It On." His emotive version of this tune is important, as the viewer is left with the impression throughout the film that Barry is nothing but a pretentious hack lacking any talent whatsoever. He brags about his musical efforts, but none of his friends or co-workers really believe that he has any musical chops whatsoever. Throughout much of the film, he banters about his band, Sonic Death Monkey, which is renamed several more times during the movie, once to Kathleen Turner Overdrive and again to Barry Jive and the Uptown Five. Thus, when he rises to take the stage at the film's end, everyone, the viewers of the film, assume that he will crash and burn. But he does not. He delivers a fine rendition of the song. And the film ends. In 2000, I didn't know much about Jack Black, and I suppose not many others did, either. 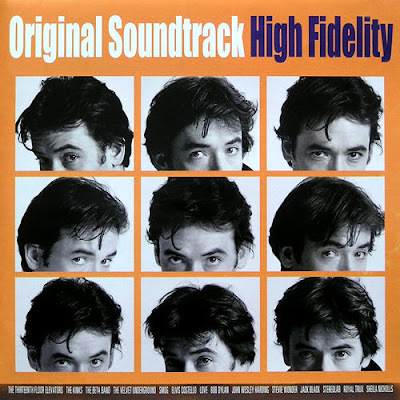 Of course, I had seen some of the films in which he appeared before High Fidelity, but I doubt I knew who he was at the time. (I adore the 1992 film Bob Roberts, in which Black appears as a sycophant of the rebel conservative title character.). He had already appeared in the Tenacious D television series, but I wasn't really familiar with it. But it was High Fidelity in which he truly came to light as a comic actor (although he has certainly appeared in his fair share of stinkers since then, including the wretched Shallow Hal and the even worse King Kong remake). But for every few instances of cinematic detritus, he charms us in a film like School of Rock. What to do? Curiously, though, the soundtrack to the film featured not the live version depicted on screen but a far more restrained studio version. I recall reading an article at the time, or shortly thereafter, indicating that Black had hoped one of the live versions recorded on film would appear on the soundtrack, but that when the soundtrack was released, the studio (or the record company) had included the studio version, which can only be characterized as lifeless. Alas. Since 2000, Black has become a major star. Whether this is a good thing, the jury is still out. Well, it's probably a good thing, as he does make us laugh, every so often. 1. "People," Cleveland Plain Dealer (April 20, 2000). Really enjoyed the book. Never saw the movie. Halfway decent movie, never read the book. Agree about King Kong where Jack Black was horribly miscast. However, I disagree with you about Shallow Hal. Although not a great movie, there are some really memorable scenes. The scene in Shallow Hal where he visits the burn unit near the end of the movie and realizes that he was only able to see the inner beauty of the burned little girl was magical. The Neil Young song they used (After the Gold Rush) made it even more memorable. Also disagree about "Shallow Hal." "School of Rock" was like having a root canal without the joy and benefit of modern narcotics. Neither REAL bands, nor actual musicians, are anything like that dumb, lame movie. Want to see a funny band movie? Try "Spinal Tap," or "The Rocker" with Rainn Wilson, which is EXACTLY like real bands and players. Danny Seraphine got thrown out of Chicago=HIS own band, that he founded; just like the movie. It's only "charming" if you call a horrible train wreck "charming." Had I known you can get a refund within 20 minutes, I would have. I want that 90 minutes back to this day, too. Michelle M - drama queen much? You should sue the movie industry for confronting you with a movie you don't understand. It's not a band movie, nor is it supposed to be super-realistic. You noticed it's about school children who secretly become a rock band? Oh, and just as an interesting piece of knowledge: A lot of real musicians prefer "Still Crazy" to "Spinal Tap", when they want to see a realistic movie about a struggling band. Disagree about Shallow Hal and agree about King Kong. Ditto what Anonymous said. The pediatric burn unit scene in Shallow Hal with Neil Young's After the Gold Rush playing in the background always brings a tear to my eye. What were they thinking when they cast Jack Black (or Charles Grodin for that matter) in the remake(s) of King Kong?